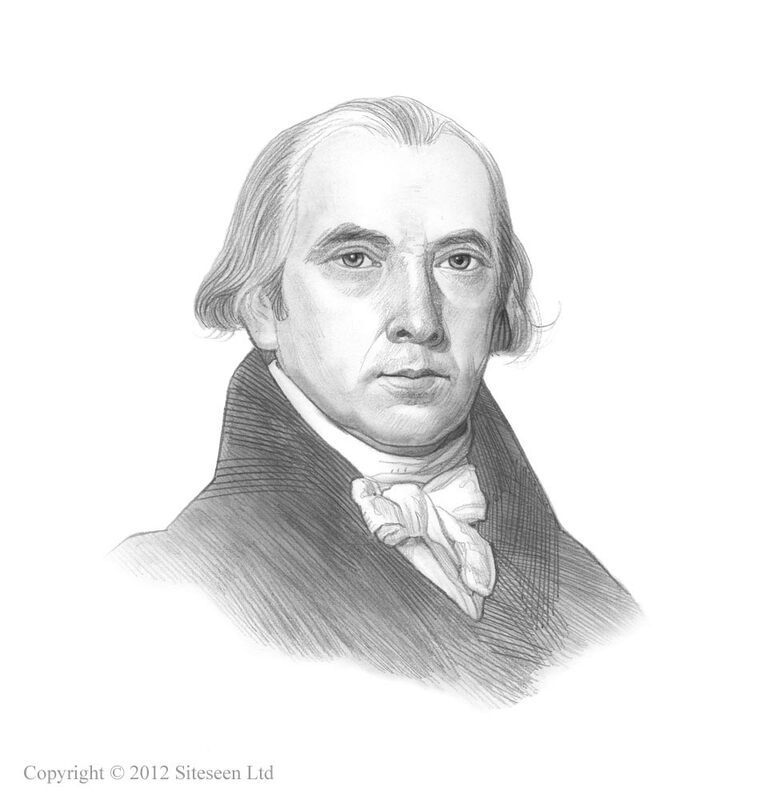 The War of 1812: James Madison was the 4th American President who served in office from March 4, 1809 to March 4, 1817. One of the Important events during his presidency was the War of 1812 which is sometimes referred to as the Second War of Independence. Summary and definition: The War of 1812 (1812-1814) between the United States and Great Britain was declared by President Madison on June 18, 1812 and lasted for 2 years and 8 months and resulted in a stalemate. The Treaty of Ghent ended the War of 1812 and was signed on December 24, 1814. The United States plan of campaign for the War of 1812 was highly ambitious. The British already had a small, well trained and well supplied army in Canada and a considerable force of Native American Indian allies. At the time of the War of 1812 there was no trained American army and there was no established means for obtaining provisions and supplies for the army. The army of General William Hull, that had been raised in Detroit, Michigan for the War of 1812, was faced with an arduous march east, north of Lake Erie, to join the second army. The march was over 200 miles of wilderness. To reach the meeting point General Hull's men had first of all to cut a road through the forest. The British forces descended on the scattered detachments of the American army and seized their supplies and provisions. General William Hull was forced to send out numerous expeditions to gather provisions and supplies and to bring in the scattered settlers. These expeditions were attacked by Native American Indians, allies of the British, under the leadership of Chief Tecumseh. Chief Tecumseh was the leader of the Shawnee and a large tribal confederacy which opposed the United States during Tecumseh's War and the War of 1812. Chief Tecumseh, and the other Native Indian allies of the British, captured one expedition after another. Meanwhile the British army, commanded by Important General Isaac Brock advanced on Detroit. The Siege of Detroit of the War of 1812 lasted from 15–16 August 1812 and General Hull was forced to surrender. General Hull's Surrender of Detroit was a disaster for the Americans as the British gained control of over Michigan Territory and the Detroit region. Many other Native Indians were encouraged to attack American settlements and isolated military outposts. The British forces even invaded Ohio during this stage of the War of 1812. The War of 1812 had therefore had a disastrous start with General Hull's Surrender of Detroit on 16 August 1812 but the British triumph did not last long. During the winter of 1812-1813 Captain Oliver Hazard Perry (1785 – 1819) hastily built a fleet of 10 green timber US warships on Lake Erie. The War of 1812 for kids: Captain James Lawrence "Don't give up the ship!" On 1 June 1813 Captain James Lawrence engaged his ship, the U.S. frigate Chesapeake, with the British ship, HMS Shannon during the War of 1812. Captain James Lawrence was mortally wounded in the conflict and as the wounded Captain Lawrence was carried below, he heroically ordered "Tell the men to fire faster! Don't give up the ship!". Although the USS Chesapeake was forced to surrender, Captain Lawrence's words lived on as a rallying cry during the War of 1812. In September, 1813, Captain Oliver Perry engaged the British ships during the War of 1812. He had hoisted at his masthead a large blue flag with Captain James Lawrence's immortal words, "Don't give up the ship" written on it. The battle between the British and American ships was fiercely fought. Captain Perry's flagship, the Lawrence, was disabled and only 9 of her crew were left uninjured. Captain Perry rowed to another ship to continue the fight. The Americans were victorious and all the British ships surrendered. Captain Perry's sent a famous dispatch to Important General William Henry Harrison after the Battle of Lake Erie on 10 September 1813. Captain Perry's dispatch read "We have met the enemy and they are ours-- two ships, two brigs, one schooner and one sloop." The United States had gained control of Lake Erie in the War of 1812. The British retreated from the southern side of Lake Erie. Important General William Henry Harrison had won victories for the United States in Indiana and Ohio and had recaptured Detroit. From Detroit Harrison led his army north to fight the Shawnee led by Tecumseh and their British allies. He then crossed into Canada and on October, 1813 defeated a British army in the Battle of the Thames, during which Tecumseh was killed. The town of York was the provincial capital of Upper Canada, standing on the north shore of Lake Ontario (present-day Toronto in Canada) The Battle of York was fought during the War of 1812 on Tuesday, 27 April 1813 with American forces led by Zebulon Pike who defeated the defenders of York, under the British command of the Roger Hale Sheaffe. The U.S. troops burnt the city of York and homes were looted. Revenge for these acts were later taken during the War of 1812 by the British with the Burning of Washington DC. The War of 1812 the American armies in New York had done nothing. New American commanders were given control including General Jacob Brown, General Macomb, Colonel Winfield Scott, and Colonel Ripley. The American plan of campaign for this part of the War of 1812 was that General Brown, supported by Scott and Ripley, would cross the Niagara River and invade Canada. General Macomb, with a naval force under Commodore Thomas McDonough, was to hold the line of Lake Champlain. The British plan of campaign was to invade New York via Lake Champlain. General Brown crossed the Niagara River and fought two brilliant conflicts at the at The Battle of Chippawa on July 5, 1814 and the Battle of Lundy's Lane, also known as the Battle of Niagara Falls, on 25 July 1814. During the Battle of Lundy's Lane General Brown was obliged to retire and the American army fell back to Fort Erie. During the war of 1812 the British launched a military campaign in the Chesapeake. Beside their military operations on the Canadian frontier, in 1814 the British tried to capture New Orleans and the cities on Chesapeake Bay. The British landed below Washington undertake the Burning of Washington DC in retaliation for the burning of York. Baltimore, located in Chesapeake Bay, Maryland, was a key British target during the War of 1812. The British were soundly defeated at Fort McHenry during the Battle of Baltimore. It was at this time that Francis Scott Key wrote the "Star Spangled Banner." The defeat at the Battle of Baltimore closed the British operations on the Chesapeake in the War of 1812. The Battle of Plattsburgh (6–11 September 1814), also known as the Battle of Lake Champlain, ended the final invasion of the northern states of the United States during the War of 1812. Sir George Prevost was the military Commander in Chief in British North America (now part of Canada) during the War of 1812. General Prevost marched south with the British army from Canada, while a British fleet sailed up Lake Champlain. The forces of Sir George Prevost met General Alexander Macomb with a force of American soldiers at Plattsburg, on the western side of the lake,. Anchored next to the town was Commodore Thomas McDonough's fleet. Prevost attacked General Macomb's army and was driven back. The British fleet attacked Commodore McDonough's vessels and was destroyed at the Battle of Plattsburg. George Prevost's invasion of New York was a total failure and the British forces retreated back to Canada. The American victories at the Battle of Baltimore and the Battle of Plattsburgh helped to persuade British statesmen to agree to end the War of 1812, in which no decisive gains had been made by either side. The Treaty of Ghent was signed on December 24, 1814 between Great Britain and the United States of America and concluded the 32 month War of 1812. The Battle of New Orleans was the last battle of the War of 1812 and was fought after the Treaty of Ghent was signed. News of the Treaty of Ghent failed to reach all the American forces and General Andrew Jackson scored a Important victory at the Battle of New Orleans on January 8, 1815. The War of 1812 article War of 1812 Facts and Causes provides a fast overview and factual history timeline on the War of 1812.